On the 10th (Wed), admire the verdant scenery at Vallee de Mai Nature Reserve and then head off the coast to Curieuse Island. Keep things going the next day: kick back and relax at Anse Lazio, contemplate in the serene atmosphere at St. Matthew Apostle Church, and then kick back and relax at Anse Georgette. To see where to stay, traveler tips, more things to do, and other tourist information, go to the Praslin Island online holiday maker . Chennai, India to Praslin Island is an approximately 10.5-hour flight. Traveling from Chennai to Praslin Island, you'll gain 1 hour due to the time zone difference. When traveling from Chennai in April, plan for little chillier days in Praslin Island, with highs around 37°C, while nights are about the same with lows around 30°C. Cap off your sightseeing on the 11th (Thu) early enough to travel to Jinja. Jinja is known for adventure, historic sites, nature, nightlife, and fun & games. Your plan includes some of its best attractions: contemplate the waterfront views at Victoria Nile, steep yourself in history at Source of the Nile - Speke Monument, have some family-friendly fun at Big Game Mini Golf, and take a tour by water with Boat Tours & Water Sports. For photos, where to stay, other places to visit, and more tourist information, refer to the Jinja trip itinerary planning site . Traveling by combination of flight, car, and bus from Praslin Island to Jinja takes 11.5 hours. Alternatively, you can do a combination of ferry, flight, car, and bus; or do a combination of flight and car. Due to the time zone difference, you'll gain 1 hour traveling from Praslin Island to Jinja. Traveling from Praslin Island in April, things will get slightly colder in Jinja: highs are around 31°C and lows about 20°C. Finish up your sightseeing early on the 14th (Sun) so you can travel to Chefchaouen. On the 15th (Mon), look for gifts at Local Berbere Artisanal and then get to know the fascinating history of Chefchaouen Medina. 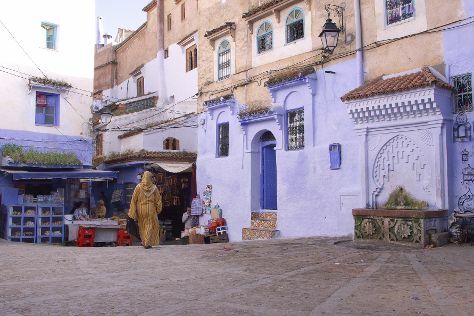 To see traveler tips, ratings, other places to visit, and tourist information, refer to the Chefchaouen journey tool . The Route module can help you plan travel from Jinja to Chefchaouen. Due to the time zone difference, you'll gain 3 hours traveling from Jinja to Chefchaouen. Finish your sightseeing early on the 15th (Mon) to allow enough time to take a bus to Fes. Start off your visit on the 16th (Tue): explore the world behind art at Nejjarine Museum of Wood Arts and Crafts, then don't miss a visit to Moulay Abdellah Quarter, then expand your horizons at Medina Children's Library, and finally admire the landmark architecture of Bou Inania Medersa. Here are some ideas for day two: admire the striking features of Bab Boujloud and then don't miss a visit to Medina of Fez. To find reviews, maps, where to stay, and more tourist information, you can read our Fes trip planner . Getting from Chefchaouen to Fes by bus takes about 3.5 hours. Other options: drive. April in Fes sees daily highs of 28°C and lows of 11°C at night. Wrap up your sightseeing on the 17th (Wed) early enough to travel to M'Hamid. Start off your visit on the 18th (Thu): take in the dramatic natural features at Atmospher Erg Chigaga. Plan my trip to M'Hamid with suggested itineraries provided by Inspirock. Traveling by combination of flight, shuttle, and taxi from Fes to M'Hamid takes 7 hours. Alternatively, you can do a combination of flight and taxi; or drive. Wrap up your sightseeing by early afternoon on the 18th (Thu) to allow enough time to travel to Essaouira. On the 19th (Fri), don't miss a visit to Essaouira Ramparts, then take a leisurely stroll along Port de Pêche d'Essaouira, then browse the exhibits of GALERIE D'ART DAMGAARD, and finally trot along with a tour on horseback. Get ready for a full day of sightseeing on the next day: see the interesting displays at Synagogue Slat Lkahal, contemplate the long history of Chaim Pinto Synagogue, take a stroll through Medina of Essaouira, then stop by Boutique de Commerce Solidaire AFBK et Cours de Cuisine, and finally glide peacefully along the water with some of the best stand-up paddleboarding in the area. 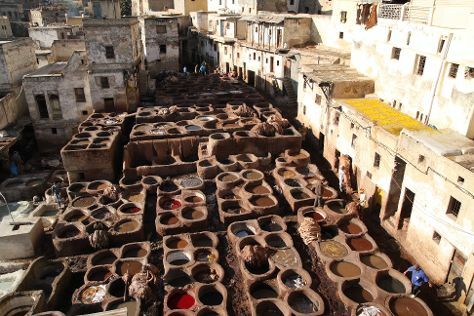 To see more things to do, other places to visit, traveler tips, and other tourist information, read Essaouira travel route builder . Traveling by combination of taxi, shuttle, and bus from M'Hamid to Essaouira takes 8.5 hours. Alternatively, you can drive; or do a combination of taxi and flight. In April, daily temperatures in Essaouira can reach 24°C, while at night they dip to 15°C. Finish up your sightseeing early on the 20th (Sat) so you can go by car to Marrakech. On the 24th (Wed), spend a fun day on foot with Walking tours. And it doesn't end there: admire the natural beauty at Jardin Majorelle, admire the striking features of Bahia Palace, indulge in some personalized pampering at some of the best spas, and contemplate the long history of Ben Youssef Madrasa. To find where to stay, ratings, and more tourist information, refer to the Marrakech trip planner . Traveling by car from Essaouira to Marrakech takes 2.5 hours. Alternatively, you can take a bus. 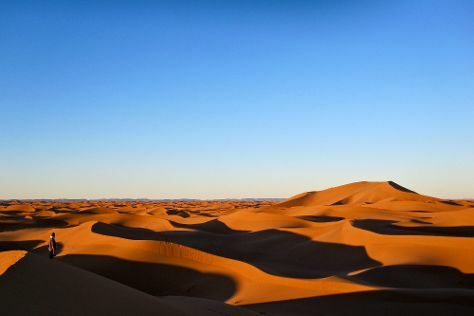 When traveling from Essaouira in April, plan for somewhat warmer days in Marrakech, with highs around 31°C, while nights are about the same with lows around 15°C. Finish up your sightseeing early on the 24th (Wed) so you can travel back home. On the 25th (Thu), explore the ancient world of Medinet Habu, explore the ancient world of Temple of Hatshepsut at Deir el Bahari, then delve into the distant past at Valley of the Kings, and finally explore the ancient world of Tomb of King Tutankhamun (Tut). 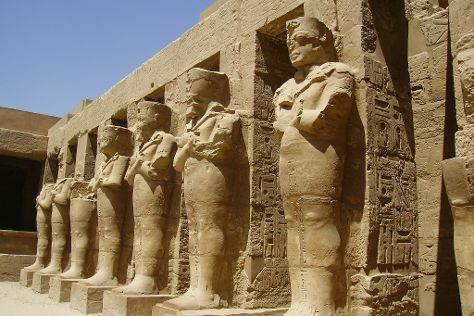 Get ready for a full day of sightseeing on the next day: look for gifts at Bait El Ainy, explore the ancient world of Luxor Temple, get to know the fascinating history of Avenue of Sphinxes, then get engrossed in the history at Luxor Museum, and finally explore the ancient world of Temple of Karnak. To find photos, other places to visit, traveler tips, and tourist information, use the Luxor trip planner. You can fly from Marrakech to Luxor in 13 hours. Other options are to do a combination of shuttle and flight; or do a combination of flight and taxi. Traveling from Marrakech to Luxor, you'll lose 2 hours due to the time zone difference. Traveling from Marrakech in April, expect Luxor to be a bit warmer, temps between 41°C and 21°C. Wrap up your sightseeing by early afternoon on the 27th (Sat) to allow enough time to travel back home.